Nintendo's free-to-play experiment Pokémon Shuffle continues to get some neat updates, with the latest offering the game's first ever "Escalation" battle. Of course, the title has had challenge updates in the past, but this one is unique. While the other challenges have largely been timed events, the difference here is that as you beat the mode over and over, the difficulty rises - but so too does your chances of actually bagging the 'mon at the end. For example, when you first play the challenge, your chances of catching Giratina are 1 percent - however, the fifth time you beat it, that rises to 5 percent. But there's more! Upon reaching Level 5 of the Giratina stage, you will bag a handsome 1,000 coins. Level 10 offers a Disruption Delay, while Level 30 gives you a Mega Start. Finally, at Level 50 you earn a Mega Speedup. You actually get a Mega Speedup for free just by downloading the update and booting up the game, so what are you waiting for? Good I need something to calm me down after the the news article about the randomly generated Nintendo E3 Plans website. This is definitly one of the better updates. Let's not forget that the game has added 10 new regular stages and 3 new expert stages, this was a big update! Yay, that's me, Kieran Fifield Sweet as a nut, got my 1st shout out! Woke up today and got my result from the Venosaur event. I placed at... 10009. Still havent tried the last update, maybe its time to catch up. I remain stuck on level 150 but I keep playing too! Well that's stupid. They don't let you us eyou runused moves to increase your chance of catchign him, so i tonly took 2 moves my 1st try but 16 moves went unused, 4 moves my 2nd try so 14 movues wen tunused. but worse than that, even though they are just raising the difficulty it still uses another heart each level. That's just ridiculous. It's the same map, just keep upping the difficulty and let us keep going. I have to use 1 heart each for a 2 move board and a 4 move board? I turned it off after that too annoying. And it's not like I don't like the game, I'm up to level 181 on the main stage. but the escalation level should just let you keep using the same heart as long as you keep beating the level and only use the heart when you lose. He is currently at level 7 on my system. If I catch him at level 10 will he be level 10 or will he drop back down to level 1 and be weak? Managed to catch Giratina at 5%! Up to level 20 and still haven't caught him. But I'm very happy about the new stages, also got my Venusaurite. @rjejr Now, what would be the point of that since they want you to dig in your wallet? Hehe... I feel you but that's how free-to-play works: dangle the carrot, watch user writhe in pain, and finally some will part ways with their cash. Not I but many will and do. @c1pher_c0mplet - "but that's how free-to-play works"
I've played many match 3 "free-to-play" games in my life - currently around level 959 on Candy Crush Saga - and every one I have ever played before this 1 only took a life when you died, not on every level. And I don't think Puzzle and Dragons ever took a life, could play that game forever when it launched a couple of years ago. And no, I've never paid a penny either, if I wanted to spend money on a game I wouldn't play one called "free" to play. Caught him at 7% Hopefully Giratina can help with the insanely difficult fight against Mega Mewtwo Y. @WreckItRyan You'd be better off leveling up your best Ghost and Dark types against Victini on Saturdays then buying a Mega Start for Sableye for the actual battle. 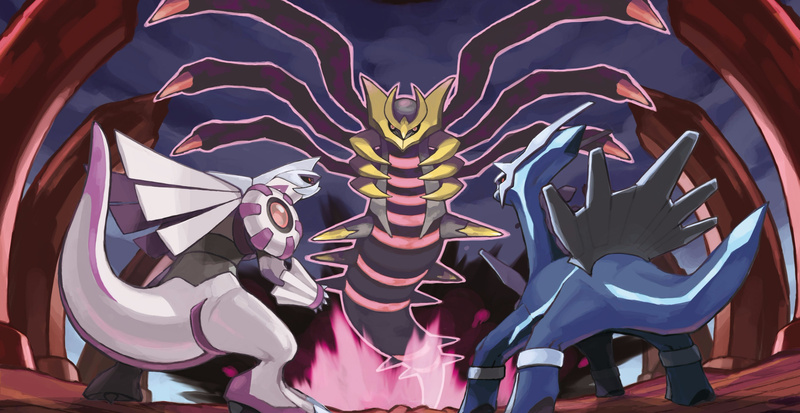 Although, as a Ghost type with its nearly unmatched 80 base attack, yes Giratina will also be quite helpful once you get it leveled up. It is a heart burner getting through the stages over and over, but at least I caught him eventually and its a useful Pokemon. I usually can't place high enough to get the special stones during competitions so that's frustrating I don't know how people have Pokemon at max level, they level up soooo slowly. I've played through most of the game. Same here. Haven't been able to max one single Pokemon. I think that Ampharos is my highest level Pokemon... at 7. I played like 3 times a day (about 15 hearts), and I tend to use my coins specially in order to upgrade them, but to no avail. Having said that, I haven't spent one single cent. By the way, I played with three 3ds (in order to get more Streetpass hits) and managed to trap Giratina with 3% on one, but with 20% on another one. Nice setup. I use Mega Gengar, Zoark and Absol, along with Giratina now.